As I mentioned friday, Pepsi has a lot goin on-line. I'm just going to point out a few things I found. 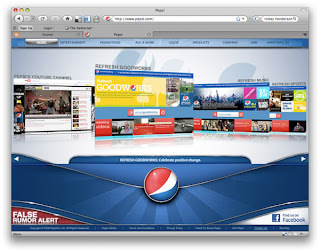 The pepsi homepage has always been a product of Flash and love. 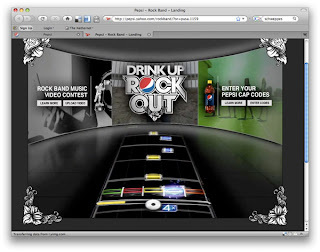 If I remember right, I think Pepsi was one of the first big commercial sites to create a noteworthy Flash homepage. One thing Pepsi is doing online is a series of pages based around the idea of Refresh X. X being Culture, Music, Sports, Goodworks or Everything. Each of these pages highlights activities or deeds done that fit the refresh theme. There was an abandoned elevated railroad track on NY City's west side that 2 guys turned into a small park. 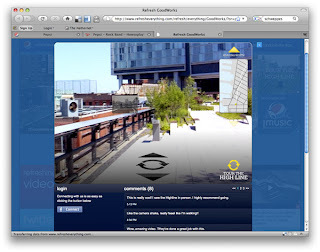 This above is a virtual tour of that park. It's first-person view and feels like your following along with the person holding the camera. Pepsi is also all over the YouTube front. They have their own channel called PopTub. The description is: "We make YouTube videos about YouTube videos on YouTube. It's not that complicated." Reminds me of Rocketboom, but just for YouTube. And lastly, to further cement Rock Band into our cultural psyche, you can now win an MTV Video Award for your own Rock Band video submission. thank you Pepsi?